Judgment: Affirmed, 6-3, in an opinion by Justice Thomas on February 27, 2018. 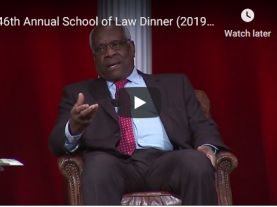 Justice Thomas, joined by Justices Breyer, Alito and Kagan, concluded that Section 2(b) of the Gun Lake Act does not violate Article III of the Constitution. Justice Breyer filed a concurring opinion. Justice Ginsburg filed an opinion concurring in the judgment, in which Justice Sotomayor joined, concluding that Congress acted effectively to displace the Administrative Procedure Act’s waiver of immunity for suits against the United States — which enabled Patchak to launch this litigation — with a contrary command applicable to the Bradley Property. Justice Sotomayor filed an opinion concurring in the judgment, concluding that that Section 2(b) of the Gun Lake Act is most naturally read as having restored the Federal Government’s sovereign immunity from Patchak’s suit challenging the trust status of the Bradley Property. Chief Justice Roberts filed a dissenting opinion, in which Justices Kennedy and Gorsuch joined. Nov 11 2016 Brief of respondent Match-E-Be-Nash-She-Wish band of Pottawatomi Indians in opposition filed. Nov 14 2016 Waiver of right of respondent Sally Jewel, Secretary of the Interior, et al. to respond filed. Nov 14 2016 Motion for leave to file amici brief filed by Federal Courts Scholars. Nov 28 2016 Opposition of intervenor-respondent Match-E-Be-Nash-She-Wish Band of Pottawatomi Indians, to motion for leave to file amicus curiae brief of Federal Courts Scholars filed. Jan 12 2017 Order extending time to file response to petition to and including February 16, 2017. Feb 15 2017 Order further extending time to file response to petition to and including March 20, 2017. Mar 20 2017 Brief of Federal Respondents in opposition filed. Apr 03 2017 Reply of petitioner David Patchak filed. May 01 2017 Motion for leave to file amici brief filed by Federal Courts Scholars GRANTED. May 01 2017 Petition GRANTED limited to Question 1 presented by the petition. May 16 2017 The time to file the joint appendix and petitioner's brief on the merits is extended to and including July 13, 2017. May 16 2017 The time to file respondents' briefs on the merits is extended to and including September 11, 2017. Jul 12 2017 Brief of petitioner David Patchak filed. Jul 19 2017 Brief amici curiae of Federal Courts Scholars filed. Sep 12 2017 Record requested from the U.S.C.A. District of Columbia Circuit. Sep 18 2017 Motion for divided argument filed by respondent. Oct 10 2017 Motion for divided argument filed by respondent GRANTED. Nov 07 2017 Argued. For petitioner: Scott E. Gant, Washington, D. C. For federal respondents: Ann O'Connell, Assistant to the Solicitor General, Department of Justice, Washington, D. C. For Match-E-Be-Nash-She-Wish Band of Pottawatomi Indians respondent: Pratik A. Shah, Washington, D. C.
Feb 27 2018 Adjudged to be AFFIRMED. Thomas, J., announced the judgment of the Court and delivered an opinion, in which Breyer, Alito, and Kagan, JJ., joined. Breyer, J., filed a concurring opinion. 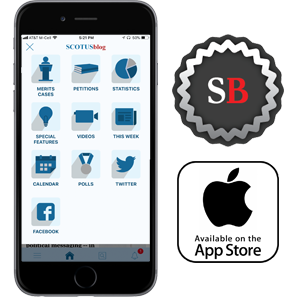 Ginsburg, J., filed an opinion concurring in the judgment, in which Sotomayor, J., joined. Sotomayor, J., filed an opinion concurring in the judgment. Roberts, C. J., filed a dissenting opinion, in which Kennedy and Gorsuch, JJ., joined.